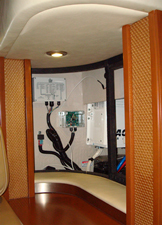 SeaCurity Systems of NY has twenty-eight years of experience designing and installing marine electronics systems. 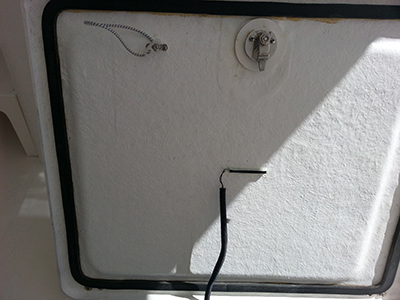 The customer's main objective was to provide a simple alarm that detects intruders before the boat is entered while communicating the boat's status such as loss of shore power, low battery or high water to the boat owner. 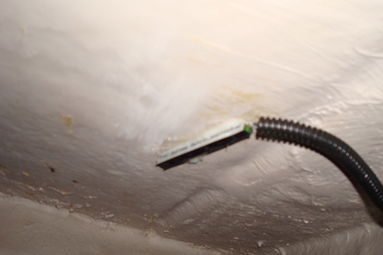 Frank Reagan is the president of SeaCurity Systems of NY and is located in Lindenhurst, NY 11507 - Telephone # (631) 226-1616. 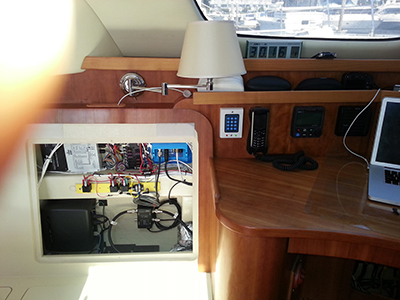 FS701DSPK-2Z - The main alarm control box is shown mounted behind the entry steps in the boats concealed A/C and DC power systems compartment. 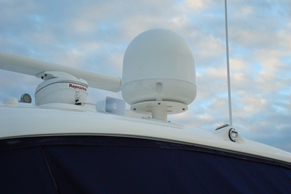 Tri-Level Sirens - The ES7 pre-warning siren is concealed in the transom area and the ES1 status siren is mounted in the main cabin. 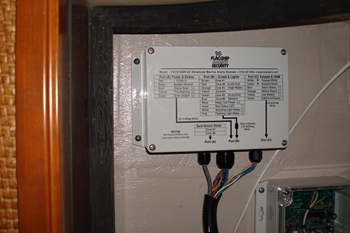 The ES30 main siren is mounted on the hard top with magnetic tamper switches. 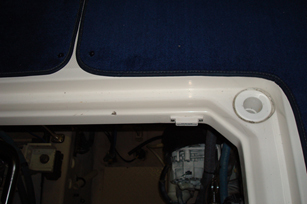 PK1 Membrane Keypad - The keypad is mounted inside the transom storage compartment to allow entry for service personnel. 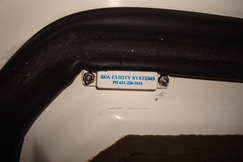 When the transom storage compartment is opened the boats boarding lights and keypad entry delay activates allowing twenty seconds to enter the keypad disarm code. 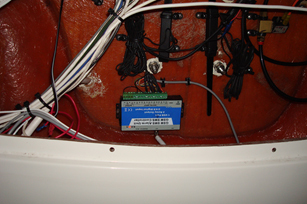 FA1 Deck Sensor - Deck sensors are mounted in various transom boarding and deck areas. 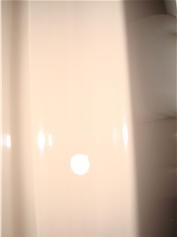 Engine Compart MG20 Magnetic Sensor - The following pictures show a magnetic switch and the magnet mounted on the engine cover. 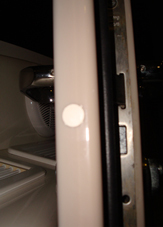 Transom and Cabin Door MG15 Magnetic Sensors - The following pictures show a MG15 recessed magnetic switch mounted inside the cabin door’s doorjamb. 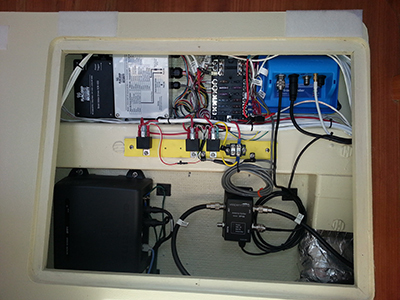 GSM Text Messenger - The GSM text messenger is mounted in the hardtop below the radar system. 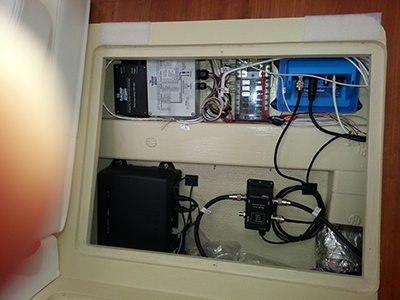 The GSM sends text messages during High Water, Low battery, A/C Loss, Intrusion, Alarm status and allows the boat owner to arm and disarm the alarm system. 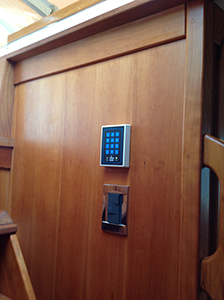 PK1 Keypad mounted inside a 47' Tartan sailboat cabin entryway. 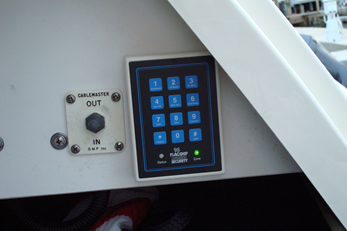 The PK1 keypad is positioned for onboard control and the customer typically uses the remote to arm and disarm the alarm to eliminate entry delays. 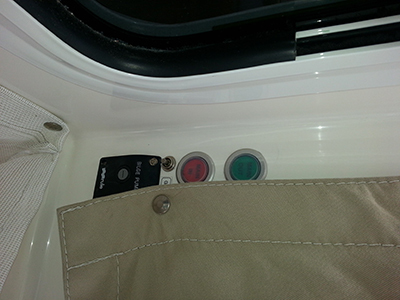 PK1 Keypad mounted in a 35' Sea Ray transom boarding area. 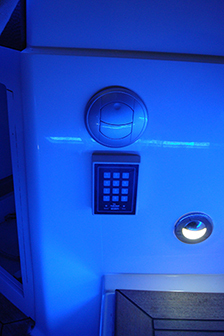 The blue LED lighting illuminates the keypad when the transom deck sensor is triggered so service personnel can arm and disarm the alarm.